Frederick John Titmus MBE (24 November 1932 – 23 March 2011) was an English cricketer, whose first-class career spanned five decades. He was the fourth man after W.G. Grace, Wilfred Rhodes and George Hirst to take 2,500 wickets and make 20,000 runs in first class cricket. Although he was best known for his off spin (though at first he bowled medium pace as well), he was an accomplished lower-order batsman who deserved to be called an all-rounder, even opening the batting for England on six occasions. Outside of cricket, Titmus was also an able footballer; at one stage he was contracted to Watford as a professional, having earlier played for Chelsea as a junior. Titmus was in his schools first XI by the age of thirteen, and when sixteen he wrote to Lords, the ground being close to his home, to ask for a trial. He was accepted onto the MCC groundstaff, and in June 1949 he made his first-class cricket debut against Somerset at Bath. Although he did little in the match, his selection for the first team at such a young age was a clear sign of his potential. 1950 was Titmuss first full season of county cricket, and he performed reasonably well, taking 55 wickets including 7–34 against Minor Counties in July. His appearances in 1951 and 1952 were restricted because of his National Service obligations, although he played for the Combined Services. In 1953 he returned to play for Middlesex full-time, and took 105 wickets, the first of 16 years in which he would reach three figures. 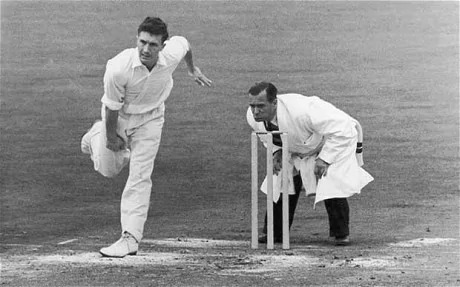 1955 was a good year for Titmus, as he did the double for the first time: he took what would remain his best seasons haul of 191 wickets at just 16.31, taking five or more wickets in an innings on no less than 18 occasions. 158 of these wickets were for his county, beating by four the record set up in 1900 by Albert Trott. He also passed a thousand runs for the first time, scoring 1,235 including the first of his six centuries, making 104 against Hampshire albeit in a losing cause as Middlesex lost by an innings. 1974/75 saw Titmus make an unexpected return to the England team, as he played in four of the six Ashes Tests. Though he took only seven wickets, he scored 61 at Perth. That winter also saw Titmus play his only two One Day Internationals, both against New Zealand. Both games were ruined by rain, but in the second at Wellington he took 3–53 from his seven eight-ball overs, his only ODI wickets. Having coached in South Africa on several occasions earlier in his career, in the 1975/76 winter Titmus played for Orange Free State in that countrys Currie Cup competition, and took 42 wickets at 16.30. His career was beginning to wind down, and 1976 was his final full year in England. After the end of that season he went to coach at Surrey, playing for that county against Kent in 1978, but it was an unhappy time. He reappeared spasmodically for Middlesex in 1979, 1980 and 1982. His very last appearance came by accident: attending the Middlesex v Surrey match in 1982 as a spectator (aged 49), he was prevailed upon to play by Middlesex captain Mike Brearley, and the gamble paid off: Titmus took 3–43 on a pitch taking spin, and Middlesex won by 58 runs. He thus became one of the very few men to have played first-class cricket in five decades (1940s – 1980s) (W. G. Grace was another).